Fiji's military has called for the country's chief of police to resign amid continuing simmering political tensions and fears of a coup. Acting armed forces chief Capt Esala Teleni said he asked Commissioner Andrew Hughes to quit over claims the military illegally took ammunition. Tensions have been high since Mr Hughes suggested he might charge military chief Frank Bainimarama with sedition. It follows Mr Bainimarama's threat to remove PM Laisenia Qarase from office. Cmdr Bainimarama backed down from those threats at the weekend after Mr Qarase met his demand to amend controversial legislation, removing amnesties for people convicted over Fiji's 2000 coup. Capt Teleni, who stood in for Cmdr Bainimarama until he returned from overseas at the weekend, confirmed he had written to Mr Hughes calling for his resignation. It followed Mr Hughes' claims that the military took ammunition from a dock last week without getting the appropriate release. 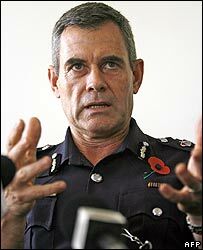 The police commissioner said he withheld a permit for fear the military would launch a coup against the government. Mr Teleni said it was wrong for Mr Hughes to be both complainant and investigator in the case. "I told the commissioner that if he insists that the military should be investigated for the removal of the ammunition from the port of Suva last week, then in the interest of justice and fair play, he must step down," he said. Mr Hughes told Fiji radio he had no intention of resigning. The rift between the military and the government has been growing for months. At the heart of the feud were plans by the nationalist government to offer amnesties to those involved in a racially-motivated coup six years ago. Cmdr Bainimarama was bitterly opposed to the law, having been the main target of the mutiny and forced to flee for his life. He also played a key role in putting down the uprising, and had called on Mr Qarase to resign for not doing enough to bring its perpetrators to justice. Mr Qarase tried - but failed - to dismiss Cmdr Bainimarama from his post while he was abroad visiting Fijian peacekeeping troops in the Middle East. Both men have played down fears of a possible coup. Mr Qarase said he was ready to meet Cmdr Bainimarama for talks to resolve the stand-off.